So Tiny Epic Galaxies is but one element in a larger franchise of "Tiny Epic" games. And we haven't really a lot of the other games in the line given quirky themes like Tiny Epic Western. But I suppose things changes significantly when Tiny Epic Quest came along as the game included a pretty major spin on the core game engine they had been using for their various game variants. What really shook things up is the introduction of their now trademarked ITEMeeples, which are just too cute to ignore. The addition of little peg holes for inserting weapons and other accesories into the "hands" of the Meeple tokens was a genius idea that helped shake things up and provide some real play value to the game beyond your typical wooden tokens. It also helps that the game is nicely challenging. 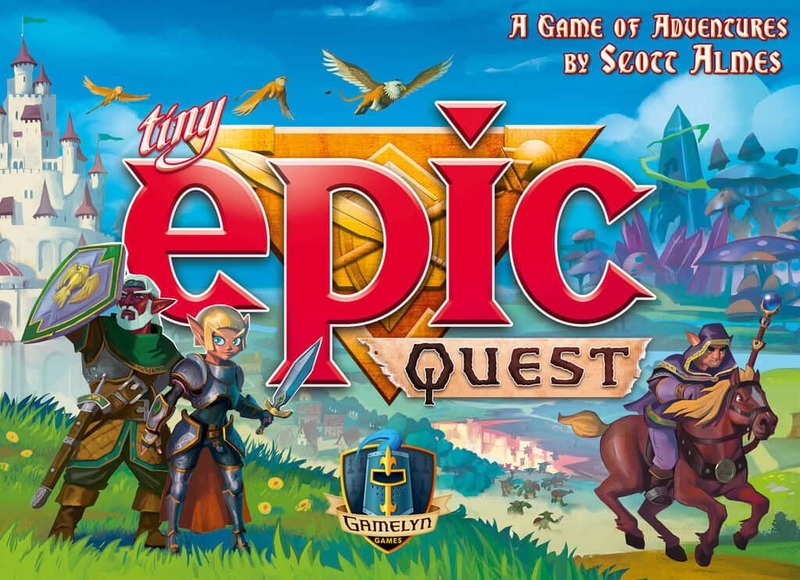 Tiny Epic Quest is a small box strategy game designed by Scott Almes for Gamelyn Games. The game supports 1-4 players and needs a fair amount of table space. Each player controls 3 heroes represented by three ITEMeeples and will trying to score as many points as they can within 5 rounds of play. Each round is divided into two phases - the Day and Night phases. During the Day players move around the randomly layed-out cards that represent the Kingdom and will either go to spaces that they'll interact with during the Night phase or a few spaces with Day time effects like the Mushroom Grottos or even other Castles. Players can try to achieve quests in the day - mainly movement quests but possibly some item quests as well. During the night players will fight goblins, explore temples and learn magic spells all to gain more points for end game. There's a particular chart to follow that explains how many points you get for things that you complete and the quests you fulfill and that sort of defines the end game. Your main interaction with other players is competing for quests for the most part. But there's a whole lot of game to juggle anyway so who needs more on their plate? What I Liked: The ITEMeeples are a super brilliant development and how they work with the game is genius. Beyond the game benefits for completing item quests of finding legendary items, it's simply a lot of fun to see your ITEMeeples equipped with tiny plastic swords, staffs and even boomerangs. So there are system benefits to having items as they give you advantages in the game and it's adorable to have them exploring the kingdom and completing quests. The game incorporates elements from the other Tiny Epic Games, primarily the option to copy the actions of other players and the sort of shared benefits and consequences of dice rolls. The movement phase is all about deciding whether or not you'll follow the same movement pattern as the player before and the main night adventure phase has players sharing the benefits for attacking goblins or advancing in temples but also sharing the pain of attack dice. The ebb and flow feels very similar to the other Tiny Epic games but still quite distinct. What Could Have Been Better: They weren't kidding about the "epic" part of things as the game can start to feel a little long given all the interactions between players. Just figuring out movement and whether or not each player will follow the same movement option can slow things down a bit, as similar with Tiny Epic Galaxies. It's not a major deal-breaker and you just need players who can maintain table discipline, but it's still another thing to watch out for. Across five rounds of play it's still very possible to run out of quests, which felt a little odd given all the effort to maintain the balance between all the game components. You can also run out goblin tokens and the incidence of that makes me feel like the game could have benefited from a few more tokens or a few more item quests to keep things fully supported. TL;DR: Tiny Epic Quest is a whole lot of strategic adventure in a conveniently-sized package. The ITEMeeples are a fun addition to the gaming world and you know we haven't seen the last of them either. Thus the game gets a good 4 cute little weapons out of a possible 5.